Steelwater Extreme Duty 22 Long Gun Safe Review: Fire Protection for 120 Minutes. Description: Is the Steelwater gun safe a good option for your rifles? 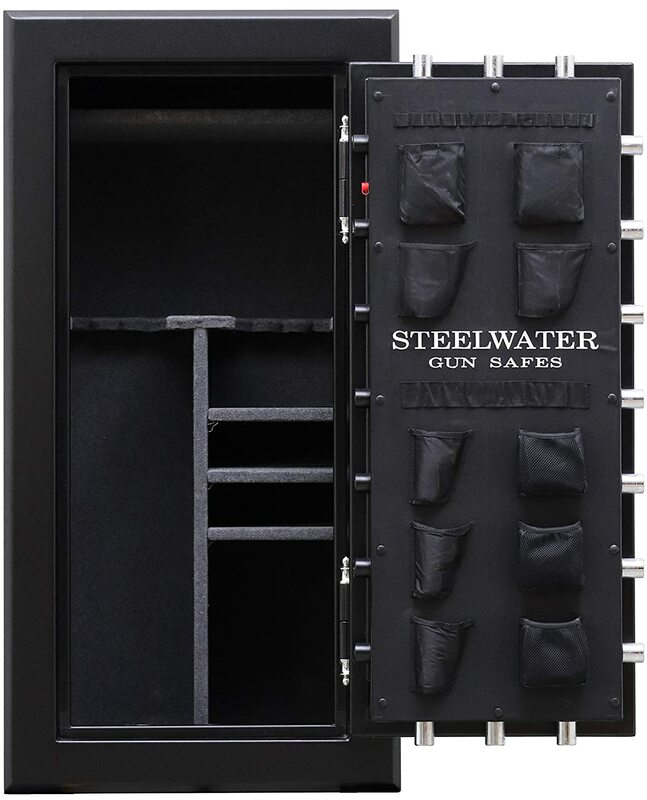 This Steelwater gun safe review examines its features, pros, and cons. If you have a large collection of rifles and want a secure place to store them, one name that has no doubt come up in your search is Steelwater, in particular, the AMLD593924-blk. its big, spacious and heavy, but is it any different from the others? That is what this Steelwater gun safe review is going to find out, Dimensions and Capacity. 1.3 Door, Locking Bolts and Hard Plate. 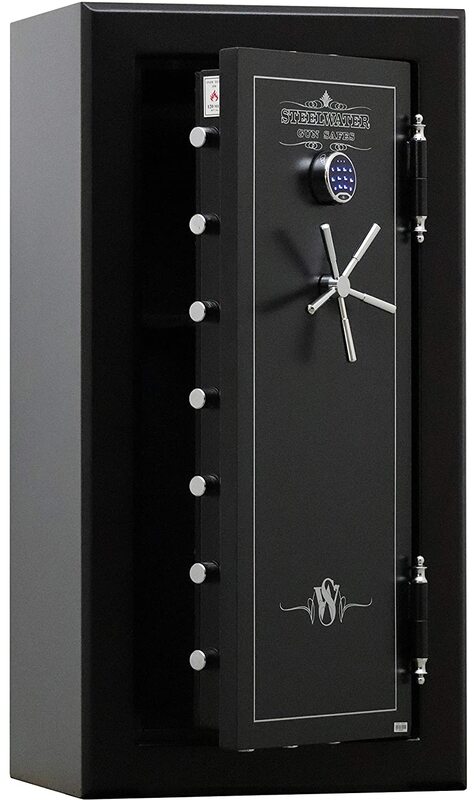 The gun safe measures 59 x 39″ x 24″ (plus 3 inches if you include the handle). The interior is 55 ½” x 36 1/4″ x 20 5/8″ and weighs 689 lbs. This translates to a maximum capacity of 39 long guns, though Steelwater recommends 24 to30 long guns. In addition, there are a ton of pockets and lots of shelves to store pistols, ammo and other gun paraphernalia. The interior has a gun rack with 3 sections. Each one can hold about 13 long guns. There is a total of seven shelves in the safe. Each one is removable and adjustable so you can arrange the content just the way you want them. The large shelf measures 36 x 14 3/4 inches (W x D) and can be used to store various items. In a word, the construction is solid and it is also very heavy. You may need to move this safe from one place to another. And for that, you should know How To Move a Gun Safe. combination. However, youll still need the primary lock. The security lock is good enough as it is, but there is an option to upgrade to LaGard (Kaba) Digital Keypad. This digital locking system  UL listed 1  provides an extra level of security. Door, Locking Bolts and Hard Plate. The AMLD593924-blk has eighteen 1 1/2 &quot; lock bolts. These are larger than the average for better protection against attackers. The door is made from heavy-duty composite materials and is 5 inches thick. This ensures no one with a pry bar will be able to use force, let alone open it. A close look at the (18) 1 1/2 &quot; locking bolts also show its 8x hard plate is resistant to drilling. This also serves as protection for the linkages and gear drive. The gun safe has LED lights that turn on automatically when the door opens. The lights also go off on their own when you shut the door. The door also has a fire seal that activates in case there is a fire. A closer examination of the gun safe reveals the carpeting. You can adjust the carpeting to provide maximum protection for your guns. With several pockets on the door and shelves, you can put a lot more than just long guns in the AMLD593924-blk. The AMLD593924-blk has a gear drive linkage mechanism that serves as extra protection versus drilling, prying and use of blunt force. This is an excellent feature thats more effective compared to a cam drive. are also made of steel so the shelf doesnt break down. A rechargeable dehumidifying box (dry pack 450-gram silica), as well as 2 USB ports and 3 AC outlets with power supply, are included. With the features highlighted earlier, it should come as no surprise that the AMLD593924-blk compares very well with other products. The body is made of 9 gauge steel and goes beyond the basic requirements set by the California DOJ. The door is not only 5 inches thick, but it also has a multilayered fireboard layer. What this does is provide fire protection for the door jams, floor, ceiling, and walls. The fireboard works especially well with the lock bolts and the hard plate. The safe also has a spring loaded re-locking bolt just in case the lock is destroyed by burglars. The black powder coated finish has a semi0gloss finish that is as durable as it is strong. A lot has been said about its fireproofing, and it lives up to the hype. You dont need to do anything to activate the seal. It kicks at the moment theres a fire and its thickness expands up to 8 times its normal size. Compared to other long gun shelves, the Steelwater provides a lot more in terms of security and dependability. There are a lot of products that claim to be fire resistant, but few of them have actually proven this. The Steelwater has, and that makes it a winner. Steelwater carved a reputation for quality and dependable gun safes, and the AMLD593924-blk shows again why the company is highly regarded. I will not repeat the stuff I mentioned in the review above but suffice to say that if youre a gun collector and want maximum security and protection, the AMLD593924-blk is the one. This Steelwater gun safe review, in other words, gives this one a full recommendation. If you dont want to settle for second best  and you shouldnt  this is one to buy right now. First Alert 5200DF Review: Portable Handgun or Pistol Safe.